I’m going to deviate from my how-to’s, tips and insights today to comment on a particularly ingenious use of social media strategy that I read about yesterday. I wanted to bring it to your attention because it’s an excellent example of thinking outside the box and how, as social media strategists, we must capitalize on figuring out what our clients want and need. In South Korea, a campaign was designed by Cheil Worldwide for their client Tesco-Homeplus. Homeplus is the number-two grocery store in South Korea. However, like most businesses, they are vying for the number one spot. With little capital to open new stores, Tesco wanted to close the gap without opening more stores. The South Korean people are among the most hardworking people in the world. The dislike grocery shopping and see it as a waste of time. They also know that traditional marketing tactics do not work. Wal-Mart and Carrefour, two huge names in retail, have already pulled out of South Korea due to sluggish sales. Wal-Mart and Carrefour outlets in South Korea were simple in appearance. They sold products by the box. They did not understand their market. E-Mart, the number one retailer in South Korea, built eye-catching displays and hired clerks who sold products with megaphones and hand clapping. They did understand their market. So what solution did Homeplus come up with? How did they use their knowledge of the South Korean people to their advantage? Instead of building more stores for the people, they brought the store to the people. 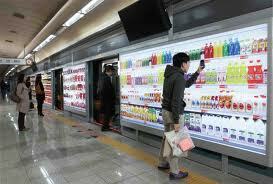 Large, wall-length billboards were installed in the Seoul subway station, designed to look like a series of supermarket shelves and displaying images and prices of a range of common products. Each sign also includes a QR code. Shoppers can scan the code of any product they would like to purchase, adding it to their online shopping cart. After the web transaction is completed, the products are delivered to the person’s home later that day. The strategy makes productive use of commuters’ waiting time, while simultaneously saving shoppers time spent going to the supermarket. I wanted to bring attention to this amazing display of digital marketing because it’s the perfect example of what those of us in the social media world often miss. Instead of trying to figure out how to sell our client’s brand to the masses, we are better off in trying to determine what the masses need and how to give it to them. We need to understand who our client is, their culture, their tastes, their likes and dislikes. We need to engage them in conversations and listen when they speak, suggest, criticize and complain. After all, social media is all about relationships. In order to be effective as a social media consultant, we can never lose sight of this fact. So what were the results of this bold experiment? Homeplus is now #1 in online sales and a close #2 offline. This is a great example of using insights about what your customer wants and needs to create an effective social media solution to overcome path-to-purchase obstacles.